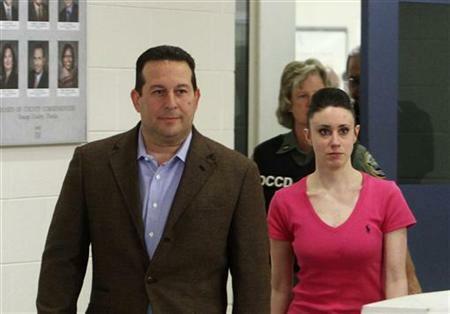 A judge has ordered that Casey Anthony serve one year's probation in the state of Florida for a check kiting fraud.She must return there within two weeks. It is a sad state of affairs when the judge's order is seen as some kind of victory for opponents of the woman accused of killing her child. The general consensus is that Anthony is the closest thing to OJ Simpson in terms of guilt we have seen since that infamous case. Judge Belvin Perry found that Anthony must return within two week's to serve out her probation for a year for the check kiting fraud. The judge found that Anthony must still serve the probationary period in the state of Florida, despite an initial interpretation that she could do so out of state. So get ready for another major burst of publicity around this sordid case which has damaged everyone connected to it. The judge has mercifully ordered that Anthony's residence be kept secret otherwise, no doubt. we could have looked forward to Nancy Grace broadcasting live outside for the next six months. At least we have been spared that.